Born in 1981, Alaa Awad is an Egyptian painter and muralist. 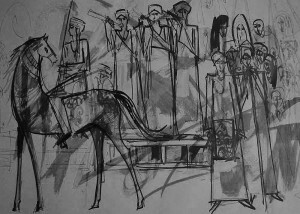 Inspired by ancient Egyptian heritage and contemporary society, some of Awad’s most popular work includes scenes of celebration, victory, Sufism, Egyptian social life and culture. Currently, he serves as an assistant lecturer and PhD candidate at South Valley University (SVU), Faculty of Fine Arts. His PhD working dissertation title is, “Artistic Vision Inspired by the Murals of War and Peace in Ancient Egyptian Art” and will be released in 2019. His collegiate resume also includes an M.A. in Fine Arts from Helwan University and a B.A. in Fine Arts from SVU. Alaa Awad also serves as a demonstrator at the Faculty of Fine Arts SVU since 2006. Awad has participated in international exhibitions and events including China, United States, Denmark and Germany. 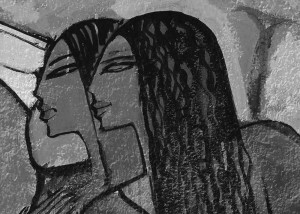 Alaa Awad is an artist who knows how to benefit from his own diverse cultural and artistic Egyptian heritage. 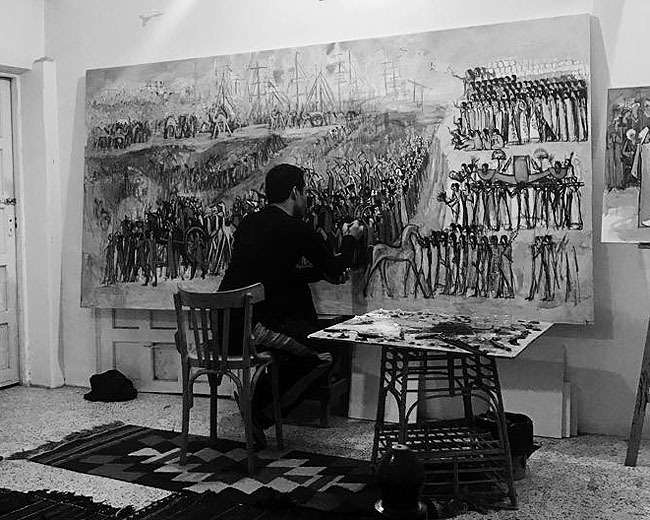 By employing both culture and heritage, he is able communicate a depth of richness and uniqueness into his work, taking on most especially, the inspiration of ancient Egyptian heritage. Perhaps millions within Egypt and nations throughout the world know of his funerary mural painted in 2012 on Mohamed Mahmoud Street near Tahrir Square. 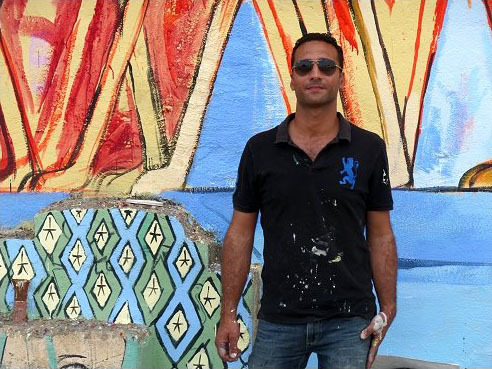 Alaa Awad’s mural harnessed the soul of the Egyptian People giving an unmatched yet muted voice to the tumultuous emotions and events that took place during the Egyptian revolution. These murals, unfortunately, have been removed by authorities, in general, have a negative view of public art and therefore, cannot appreciate the art of painting on public walls, often mislabeled as aimless „graffiti“. The context of much of the public art on Mohamed Mahmoud Street contained significant mention towards the ruling authorities through significate periods of Egyptian history. 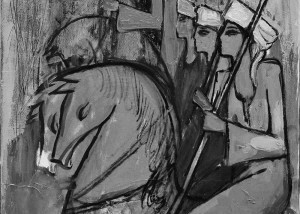 In 2003 Alaa Awad won the prize of the Al Shomoa Foundation for Culture and Arts, along with his colleague and companion, artist Ramadan Abdul-Maqtam. I am thrilled to see his return to Al Shomoa Gallery. I consider Alaa Awad as the son of liberty’s heritage, the son of free art. Without conditions or restrictions, he possessive vast knowledgeable of his cultural heritage and takes great pride in incorporating his Egyptian identity with his work. In 2012, Alaa Awad’s completed his master’s thesis, entitled, “The Influence of Gustav Klimt on Modern Mural Paintings”. The appreciation Awad has towards Gustav Klimt’s style and work has indirectly inspired his own work. 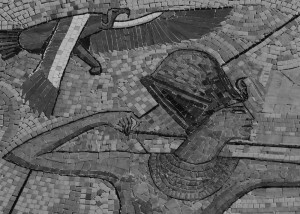 Awad’s murals contain intricate groups within the scene, taking in both ancient Egyptian inspiration and modern Egyptian topics. In addition to blending the old with the new, his expertise in bold and rich colors convey a feeling of sacredness and fluidity, revealing an open and invisible connection that is only felt by those with high sense of appreciation to heritage and history.